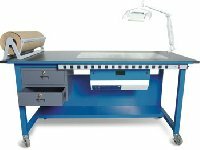 Our evidence bench series has been designed specifically for high volume processing of forensic evidence by multiple users. All evidence benches come standard with kraft paper dispenser, lockable storage compartments, open storage shelf and casters. In addition to the standard features all evidence benches can be equipped with optional electric outlet strips, filtration system and magnifying lamp. Contact a member of our sales team today for more information.